Some of the best days as a Fort Collins baby photographer are the ones that involve beautiful and delicious cakes. Delaney’s cake smash session was fit for a princess! Her cake looked as if it was out of a wedding magazine. 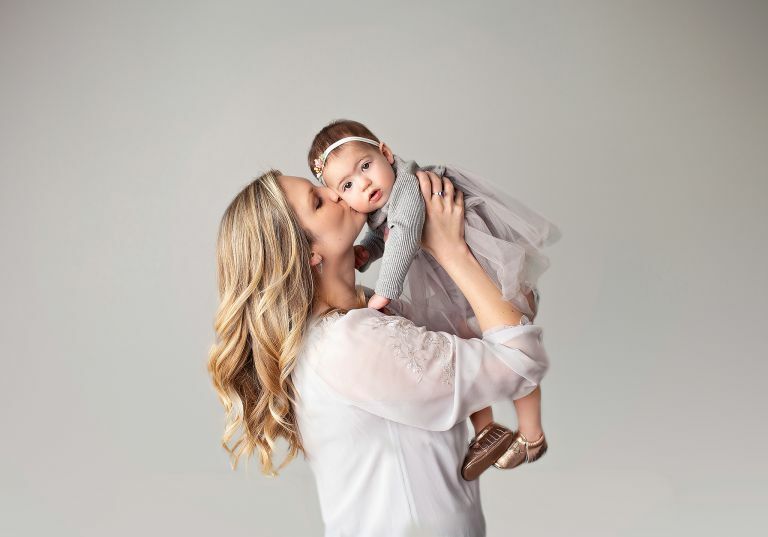 I cannot believe it has been a year since her newborn photography session let alone her mom’s snowy maternity session. Her session was so sweet with touches or cream, blush roses and pretty greenery. Mama had a boho theme in mind and it was absolute perfection. She loved the little knit bears we have for the newborn sessions and went around the studio making sure we all got to love and kiss on the bear she adored. She is such a sweetheart and when she met Easton after the shoot was done, she walked up gave him a huge hug and a kiss. It was the sweetest little moment. We might have to start setting up some play dates for these two babies. I joked with her parents that we should have just had a lovey session as she was far more interested in being a sweetheart than making a mess with her cake. Delaney was very gentle and delicate during her cake smash session and I think she thought it was too pretty to mess up. I do think mom and dad were glad that she saved some of the cake as Laura makes the most insanely delicious cakes! The studio always smells so yummy for a day or two after these sessions. Here are a few of my favorite images from her session…….